Erik from Wyoming sends us photos of his Supercharged 2015 Tacoma featuring our winch bumper in our special Teflon infused silver powder coat and a Smittybilt 9500lb winch with steel cable. Erik has also added a 3″ ToyTec Boss lift with American racing wheels wrapped in BFG KO2 tires. To top it off he has a Magnuson Supercharger making 325hp/375 ft lbs all exiting Flowmaster duals. Daren from Washington state sends us some interesting photos of his 2013 Tacoma with our winch bumper installed. Daren from Washington state sends us some interesting photos of his 2013 Tacoma with our winch bumper installed. He used a Warn M8000S with a Factor55 ProLink but also installed an N-Fab light bar ‘which is attached to the bumper with some DIY brackets.’. What is notable beyond the custom light bar installation is the fact that his Taco is supercharged. Nice work and good information to have for other supercharged Taco owners! Jim from Colorado sends us photos of his 2015 Tacoma sporting our winch bumper, Engo 10K winch, Sirius Pro Series light and Van Beest shackle combo. Nice install on a clean Taco! Another happy customer, Gus from Oregon, sends us photos of his 2015 Tacoma with our winch bumper and Warn M8000 installed. While the M8000’s control port points straight up you can still easily plug in your control cable by opening the hood or purchase an extension cable and mount it in your grille for easy access. He coated the bumper with Herculiner roll on bedliner. Another happy customer. Praveen from California sends us photos of his Tacoma with our 2012-15 Tacoma winch bumper, Engo 12000lb winch, Sirius Pro Series flood lights with Amber removable covers and Van Beest shackles. He also opted for our special Teflon black powdercoat for the bumper and the shackles. Notice the factory skid plate too. Very nice! Another customer, Glen from Florida, sends us a few photos of his 2013 Tacoma with our winch mount bumper and Van Beest shackles. He added a Badlands 9000lb winch and Quadfire LED lights. You can also see he managed to fit an under bumper receiver in there as well. Good job and a nice Taco! Zack from Oklahoma sends us a photo of his 2013 Tacoma with our winch bumper, Van Beest shackles and a Smittybilt X20 winch. He also optioned for our special Teflon powder coating. Lights are generic. Looks great! 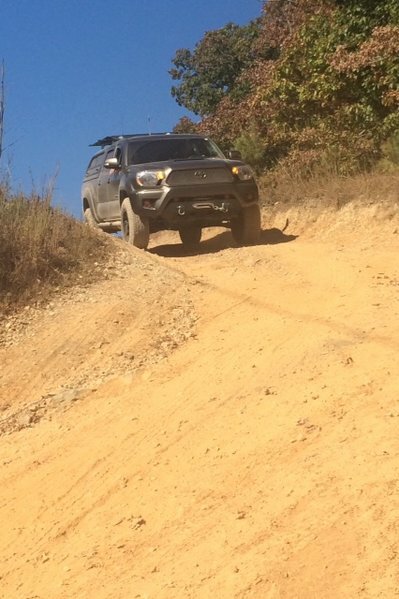 Tacoma World member Axion sends us these photos of our Tacoma Bumper on his 2013 with a Warn XPS winch. 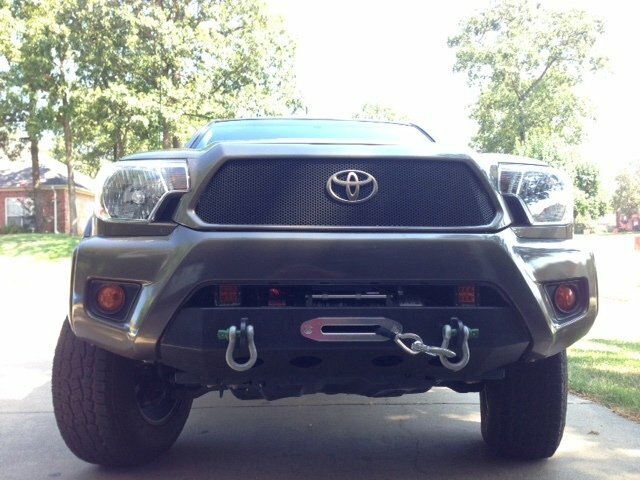 Motionridr8 shares these photos of his 2012 Tacoma from the Tacoma World forums with our new winch mount bumper. 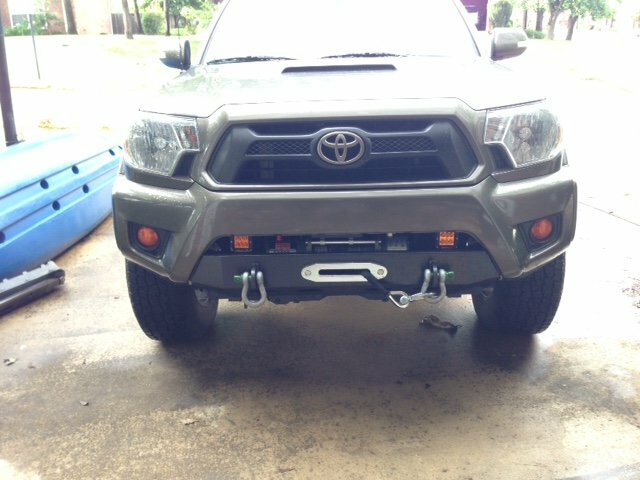 Motionridr8 shares these photos of his 2012 Tacoma from the Tacoma World forums with our new winch mount bumper. Looks great! Tacoma World member Nrish brings it all with an Engo 10k synthetic winch, Sirius 2″ lights and Van Beest USA shackles all from our store! Get it all at https://www.usoffroad.us/store !